Last November I opened up and told our story of how broke my husband and I were one Christmas season so many years ago and how it caused me to use my creative thinking skills to fulfill our Christmas list with very little money. I had no idea how well received the post would be. Honestly, all the traffic left me feeling like I should do something more for all those struggling financially like we were that Christmas. Something to guide you through each of the 10 steps the first post mentioned, plus 4 more so that you can find the funds you need to provide gifts for those you love on Christmas day. Something to help you not just create a plan, but work the plan and actually succeed–to wake up Christmas morning with gifts under the tree, stockings filled with care, and the ingredients to make a Christmas dinner in your fridge without taking a cent from your regular day to day budget. 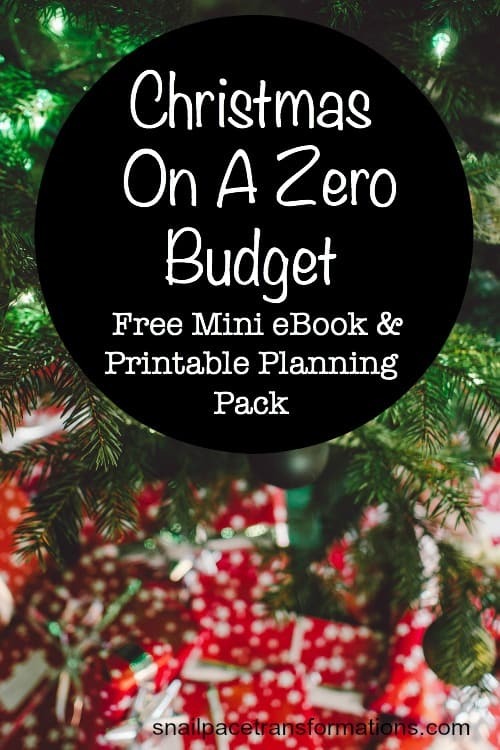 All of this led me to creating my new, free Christmas On A Zero Budget mini eBook and printable planning pack. Christmas for zero will still take work…I can’t do that for you…but I have done most of the brainstorming for you and provided you with planning sheets to help you achieve each step. 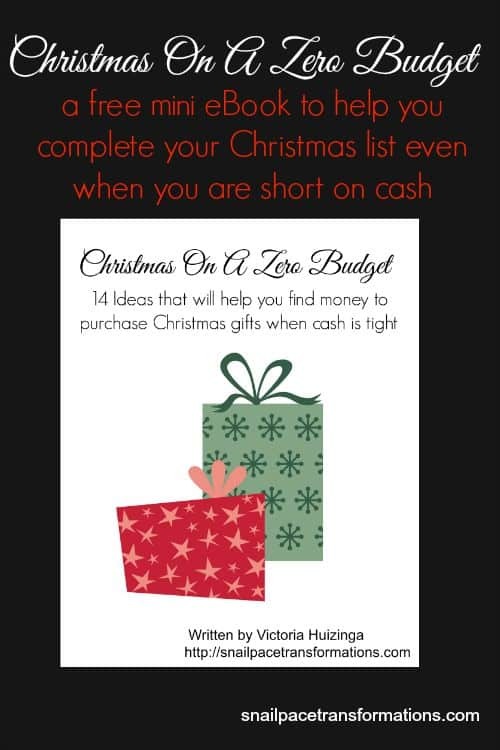 I have poured every last creative, out of the box thinking, thrifty thought into a free mini eBook and a printable planning pack that will guide you through the 14-step, two month plan that you can use to successfully create your own Christmas On A Zero Budget Plan. The mini e-book contains the original 10 ideas for creating Christmas from zero but takes them further. Plus, I added in 4 new ways to help you create Christmas on a zero budget. The printable pack contains 8 printables to help guide you through the 14 points, including plans to help you earn $175 in gift cards in 60 days as well as 2 or more books that you can use as gifts. 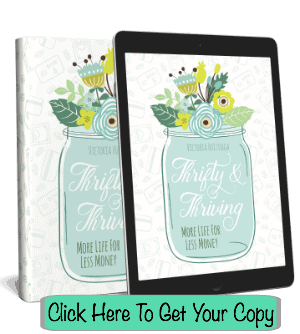 I am offering both the mini e-Book and the printable planning pack completely free to those who subscribe to my blog. 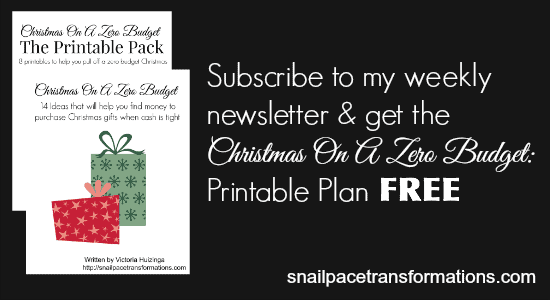 In return for subscribing you not only get the free Christmas On A Zero Budget mini eBook and the printable planning pack, but as a subscriber you also get a weekly newsletter from me that contains a personal letter from me each week, a few good deals I have found, and the links to the past weeks blog posts that I wrote. Invite all your friends to take advantage of this free offer by using the share buttons at the top and bottom of this post to share it on your favorite social media program (or share it directly from Facebook using this link just hit share when you get there) . 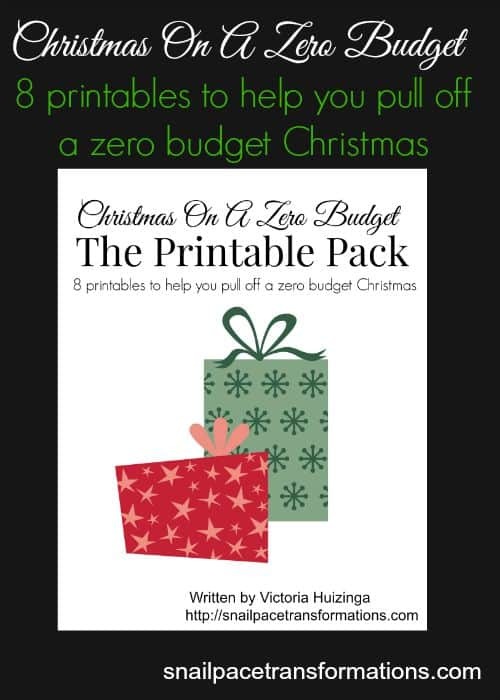 To grab your free copy of Christmas On A Zero Budget: Printable 14 Step Plan mini eBook & Christmas On A Zero Budget: Printable Pack sign up for my newsletter: click here. Thanks! My husband was laid off 8 month’s ago, so I could really use some help in planning for Christmas this year. 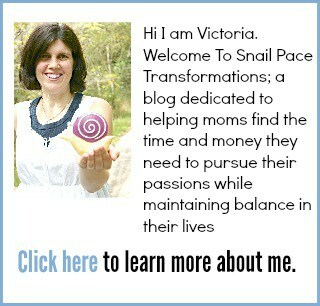 I hope the steps in my mini e-Book help and I hope your husband finds work soon. Thanks so much for these ideas! My husband and I both have been out of work for over 2 years. We can use some help in planning for Christmas. Your welcome. I hope the ideas inside help. Hi, I already subscribe to your blog, is this still available? I don’t know if I subscribed after you offered it, or what? Thanks! Bethany do you get my weekly newsletter? Or my posts as they are published? If you get my weekly newsletter the link to the freebie was in Friday’s but if you get my posts as they are published then you are following me through feed burner and are not actually on my email list. Either way I am going to go ahead and send you the link to the email you used to leave your comment in just a few minutes. I love this! And definitely timely, I am already thinking about our Christmas budget and how to best make use of the money we have. Your welcome. I hope you find it useful. These are great idea’s I am going to try to use. I am raising 5 grandchildren(ages 2-9)(3 boys, 2girls) and on a very limited income. Bills take all the money then some. I start my Christmas shopping for the following year the week of Christmas. I collect give away stuff from everybody. (my husband wants his barn back.) I try to come up with ideas to repurpose it but some of it I just don’t know what to do with so I still have it. My kids do get stuff but besides the 5 I am raising I have 6 other grandchildren. I hunt down ideas on pinterest to make from trash to treasure or recycle. I work at this all year long so that by the time Christmas gets here everyone will have a few gifts each. If you start planning your gifts right after Christmas it really helps. But that is what I have always done. I’m going to use you ebook and printables to work out my Christmas during the year. I’m a Christmas all year person. My lights are up all year and my living room is semi decorated for Christmas all year as my favorite color is red. Thank you for these wonderful gifts. I will be putting them to use.